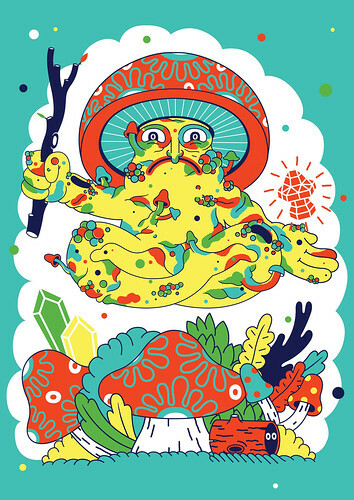 Pick Me Up, the annual graphic arts festival at Somerset House, showcases a mixture of international illustrators, graphic novelists, cartoonists and graphic designers, writes Sarah Snaith. On the ground floor of the Embankment Galleries, ‘Pick Me Up Selects’ such as Malika Favre, Jean Jullien and Hattie Stewart exhibit work ranging from overtly bold to quietly intricate. Designer Malika Favre’s Kama Sutra alphabet is racily hung against a black wall. The typographic figures, predominantly male and female pairs, are an evolution of Favre’s cover illustration and typography for the Penguin classics deluxe edition of the title, art directed by Paul Buckley. Top: Incident on the pier by Adam Graff. Member of the Hero of Switzerland collective. Illustrator Rob Flowers’ series of images and soft toys feature mythical beasts from his fictional world The Crystal Wood and are inspired by ‘folklore, myth and cryptozoology’ says Flowers. ‘I’m a big fan of 1970s children’s TV shows like H. R. Pufnstuf and Lidsville’, both created by Sid and Marty Krofft, which have influenced his psychedelic colour palette. A sample of Flowers’ toy collection is also on display including handmade Kachina dolls, McDonald’s merchandise and Native American spirit dolls. Flowers’ work appears well-suited to a publishing house such as Nobrow Press, inline with his future plans to expand his fictional world to a full-length tale. A lesser known highlight, Stuart Patience, represented by Heart agency, is exhibiting an illustrated series from The House of Epicuros, a collaboration with designer Oliver Ruuger and author Mihkel Kaevats. 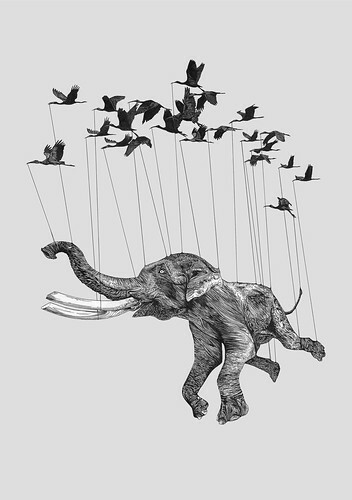 The black and white images are highly detailed technical drawings with a surreal flair; an elephant kidnapped by a flock of birds and a sinister conductor orchestrating a gruesome meal. Installation photograph by Kevin Meredith. The second floor of the festival is buzzing with collectives, poised for visitors to join them in spinning tombolas, throwing hoops and stamping mismatched faces. Fatherless collective from Rockford, Illinois. Author photograph. 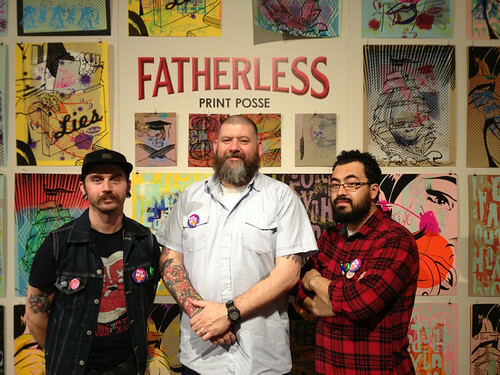 Fatherless, an American ‘print posse’ of graffiti artists, designers and educators, have prepared 30 silkscreeens and will print original works in a variety of overlayed combinations, like a ‘visual mixtape’, for the duration of the festival. After brandishing a bare arm with temporary tattoos with Puck Collective, designing a beer label with Hero of Switzerland and adorning Print Club London’s walls with decals (designed by Fred Butler), there are eager young collectives to admire: Coffee Club (former students of the University of Birmingham), Zombie Collective and Brothers of Stripe, to name a few. The extensive daily event schedule includes workshops, talks, DJ sets and screenings, many of which are free. 20 > 21 April is Children’s Weekend and features a model-making workshop with Aardman and a reading, workshop and book signing with the Gruffulo illustrator Axel Scheffler. 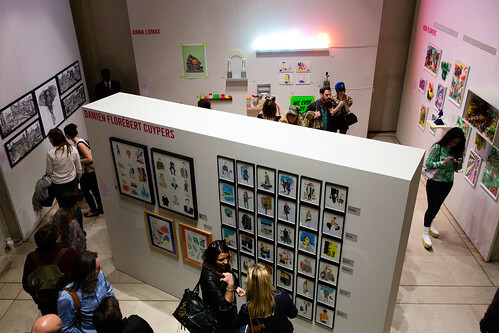 Pick Me Up 2013: Graphic Arts Festival continues until 28 April 2013. 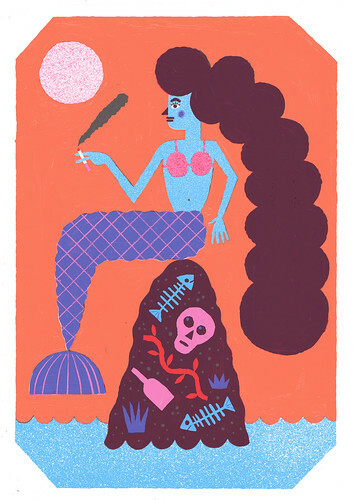 Mermaid by Liam Barrett. Member of Puck Collective. Eye is the world’s most beautiful and collectable graphic design journal, published quarterly for professional designers, students and anyone interested in critical, informed writing about graphic design and visual culture. It is available from all good design bookshops and online at the Eye shop, where you can buy subscriptions, back issues and single copies of the latest issue. You can see what Eye 84 looks like at Eye before You Buy on Vimeo.